41 mm brushed and polished 18K Sedna gold case, transparent back, screw-in crown, unidirectional rotating 18K Sedna gold bezel black Ceragold ring and diving scale, domed scratch-resistant sapphire crystal with anti-reflective treatment on both sides, sand-blasted black dial with 18K Sedna gold hands coated with vintage Super-LumiNova, self-winding chronometer Omega 8401 movement with Co-Axial Escapement, and resistance to magnetic fields greater than 15,000 gauss, approximately 60 hours of power reserve, brushed and polished 18K Sedna gold bracelet. 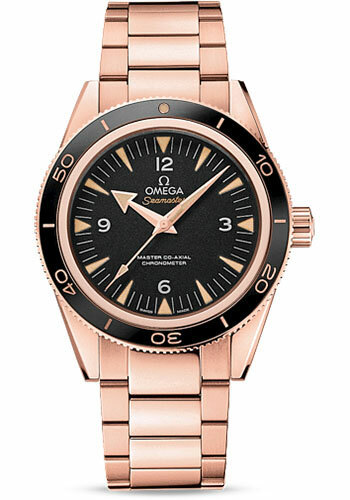 Water resistant to 300 m.
41 mm 18K sedna gold case, transparent back, self-locking crown, ceramic bezel with omega ceragold diving scale, sapphire crystal with anti-reflective treatment inside, black dial set with vintage super-luminova, caliber 8401 self-winding movement, approximately 60 hours of power reserve, brown leather strap. Water resistant to 300 m (1000 ft).